I've got a book idea that is driving me here, too. My problem is that my unit is an USFF desktop. The PCI Express slot in it has a mass watt load of 24W - and I think the 750ti is supposed to draw something like 65W max - so I'm probably not maxing out the capabilities of the card. To upgrade, I'd basically need a new MB that could take the 32GB of RAM I have and the i5 and a new case. I think that could be done for around $250. Then I could get a DSLI motherboard with PCIe slots that could handle a lot more video card - and things would be good. But tearing this one apart to rebuild it seems like a lot of work. I'm still learning too. Seems like the more lights, the longer render time in 3Delight for sure. In Iray, there seems to be a point of critical mass. Too few lights takes longer and too many as well. There's some kind of sweet spot in the middle, I think. What puzzles me in Iray is that removing the dome seems to make my renders longer in the newest version. Weird. I'm playing with Esewy's Reduced Texture script and it does a great job of getting those sizes down small enough to go on the graphics card. I like that the new update actually tells you the sizes, so you have some idea what you're working with. But I think I still need a better graphics card. A better computer too. But I think my computer and my wallet could handle a 1070. Was looking at those last night. I think you're right. There is a sweet spot for Iray lighting. Too little lights or too much lights seems to bog down the render time. I think though, for my own experiences, that using just a single HDRI, set high enough to light the scene well but not too high that it blows things out, seems to render the fastest. Thanks, Diva. Seems to be trial and error most of the time, which can be frustrating. I like the new verbose mode on the renders because I can now see when the GPU isn't being used. I've reduced textures in some scenes to fit on the card, but I've found that sometimes I have to restart DAZ to get the GPU to kick in. Thankfully, if you hit the control button while running Reduce Textures and save as a separate file, the textures load up with no problem once you restart. Kind of a pain, but now I've got it flying again. Yay! I think perhaps the biggest confusion people have is understanding the the Iray engine is fundamentally different from 3DL. In 3DL, mesh lights was really the way to get realistic "photographic" style lighting. In Iray that's not necessary. The photometric spot lights have geometry and can emulate most studio softboxes, allowing the render to give soft shadows and even lighting when desired. Mesh lights aren't required for good lighting unless you want a surface to emit light for real world effect, e.g. a light bulb, fire, tv/monitor screen etc. Simple single poly mesh lights such as Kindred Arts excellent Ghost Lights don't generate significant render times penalties, but even then could generally be replace by spotlight "softboxes". The Ghost Lights are much simpler to set up, which to me is the major and worthwhile benefit of the kit. The HRDI lighting "dome" is the fastest lighting method, provided you have an outdoor or open scene. Don't forget that you can change the lighting values of the HDRI. But you don't need to take my word, thes are easy things to verify/. One more note, changing tonemapping to make the scene brighter is not the same thing as adding more light from an Iray render time perspective. If you want faster renders, add another light or two or increase the lumen ouput of the existing light. Use tonemapping to compenstate for increased brightness if you want a darker image. More light makes for faster Iray renders. As with all things, if you choose to add more light by adding more lights, there is a point where the render time will slow down. A final tip that may cut down on render time: change the Render>Optimization>Max Path Length setting to something between 7 and 11. This is the number of bounces that iray allows. The defualt is -1 which is "infinate" bounces. 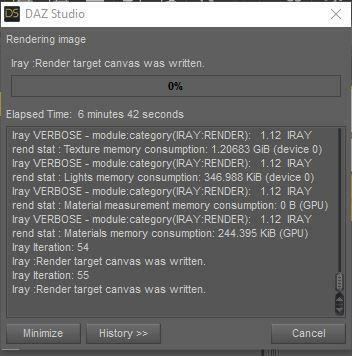 Experimentation by myself and others suggests than anything over 7 doesn't impact render quality and anything too much higher than 7 becomes diminishing returns. Verbose mode? Oy! So much new stuff to learn. I'm behind - I haven't downloaded the new Daz update. Has it given you any issues? I'm worried about installing it and then having it mess up my settings or my saved categories. Thanks, Larry, I will check my settings and make some adjustments. I've only been using Iray since last summer, and love the effect of a good HDR, especially Dimenion Theory's Iradiance Light Probes. Easy to use, double as backgrounds, fast to render. One thing I love about 3Delight lighting is its similarity to theater lighting. I have a broadcast and theater background, so that was fairly easy to grasp. To me, lighting for that engine was like lighting for the stage or tv set. I've also done a lot of photography and find I have to shift into that mindset for the Iray lighting side. It's definitely a different way of thinking about the lighting, and sometimes I'm fighting the urge to do it like 3Delight because that's what I learned first. Thanks for all of the pointers. We are all ears here! I love the white-haired fantasy people, always have. There's a long-lived race of them in one of my series. I just picked up Raw Art's Prince Albane and Princess Ali during his annual sale and need to render them too. They look like fun to work with. Anyhow, I used the same DOF and background from my Ariadne picture, combined with the render settings from Darwin's walkthrough. I tried a lot of different lighting and none of the softer stuff worked with him. He's a dramatic character and seemed to need more dramatic lighting. This is Elianeck's HDRI Lighting set and the purple lights included in it. With all the tweaks in settings, I was able to render this in a half hour, which is really good for my card, the size of the picture and the quality of it. Slight postwork- background for the door, color tweaks, siggy. I like that it's giving me the info. I can use that to figure out when I need to use that reduced texture script to get the scene to fit on my puny video card. Oh cool. The verbose window sounds really helpful. I loaded it yesterday and all of my custom categories are intact so no need to worry about that. Its funny but I have always loved the white skinned white haired characters and the dark skinned white haired drow characters myself. He looks really good I am going to have to go check that site out. Can I ask what hair that is? Thanks! That's Kerkyra Hair for V4. Had to finagle it onto him, LOL. I think it works well on the fantasy characters. I've seen it in quite a few promos. Setting the number of bounces for light makes total sense for cutting down calculations and render times. And yes, what is this verbose mode and how do I find it? Is it just a matter of reading the log file? I may have it already. This is another thing I'm discovering - that a lot of the people here are still on an older version. My introduction to DAZ was via 4.9 beta. So some of the things I hear people getting excited about, I find myself going, "Wait, you didn't always have this?!?" I'm on the fence about upgrading to the release version. Maybe I'll do it on my i7 with no GPU and see what happens there before I do it on my i5 with the 750ti. Uhoh. Look who snuck into my runtime. He's not even in the store yet! Apparently there's trouble in Sector 19. But is he the problem or the solution? That's for you to decide! This is @DarwinMishap 's new character, Iain for Michael 7, coming soon to a runtime near you! He looks incredible! Great renders! BTW, how did you get in as a beta tester? Rough draft of the next one up. Still need to tweak a few things and render fully. I had to reduce a lot of textures, especially in the background, then render in layers. Played with many different lighting formats but decided I liked the natural sunlight look the best, shadows and all. A slightly punked out Iain finds something unusual in the town square! Do fairies really exist? Aibell has the answer. Nice work with the fairy ( yes I do have a weak spot for fairies and glitter stuff) but you are giving them hunky guy a nice place to show themselves as well! Thanks! I think Aibell makes a great fairy! I just wish I could find some iray-friendly fairy wings. Apparently I don't have any. I used a few shaders and adjusted translucency to make it look a bit better. I read somewhere that the body glitter on Aibell is LIE and could be used on other characters. I wonder if it could be used on the wings...Maybe I'll try that. I think I'm also going to shrink Aibell down a bit more. I want to do an extreme closeup of the two of them, plus a farther away shot so we can see Iain's gorgeous tattoos better. Best of both worlds! And yes, I must have my hunkydunks. Maybe I need to rename that folder, LOL. Or just create a new one! I found the glitter, and the LIE settings, but can't figure out where I need to add the LIE layer for it to show up right. Brain is mush at the moment, will try later. Once turned into an Iray surface you could try activating the metallic flaces option, that should pretty much provide a glitter on your wings. You ca take a look at those car paint shader with the metallic flakes and how they work. The wings look great. Her hair is what looks a little too molded to me. Is it a Pure Hair item? Pure Hair content always seems to look more like a plastic or rubber cap than actual hair in finished renders, to me. Thanks @Linwelly - I'll check that on the wings. I do remember seeing a metallic flakes. @donavancolbert - The hair is actually Krayon Hair for G3F with default Iray shaders. This one was only 50% rendered. I will see what it looks like when it's done cooking, and may have to change the shaders to something else. I'm not liking the shaders on his hair either. That's Adam Hair for G3M, with default Iray shaders. Looks more like 3Delight to me. I'll doublecheck and may change that one out too. The OOT shaders seem to be the best around for hair. Ugh. How do I always manage to create more work for myself? Maybe I'll get this one right and then take a crack at a nighttime version. Would give me a good excuse to use Ron's new firefly brushes. You could as well dial the emissive in for the winkgs for the night time render, that is a fun option and results exactly with the light you want it to be. Here is one I did today... it isn't anything special, except that I made the art-horse, the drawing board, the board clips and the piece of paper myself in Carrara and imported it into DAZ. I'm not happy with the quality of the render. I'm using a single HDRI and it just looks very flat and CGI. I've been having a lot of fun with darker ambient outside lights and most of the character lighting coming from a nearby emissive, lately. I always have trouble with this room prop, too. It bogs down my machines and doesn't seem to have a lot of complex textures or surfaces. Oh, the image on the paper, I drew myself, paper and charcoal. ...Darwin's Hotties? Srsly? LOL Thank you. Thanks, Darwin! I could stick Iain in bad lighting and he'd still look good. You did a wonderful job on him. I'll try to do a few renders that show off his tattoos. They are great. You should think about putting them in a second set of LIE tattoos at some point. And yes, your guys are some of the best looking G3Ms around. I have most of them now and thought they deserved their own album. I'm going to redo a few of Damen's pics and stick those in there. I still haven't had a chance to do much with Parker and some of the other guys yet. I'm slacking! So many hotties, so little time! You have a great start there, Donavan! I'm impressed with how much of that you modeled yourself. Great job! I think the best way to make your render more exciting is to figure out what story you want to tell. What is the artist painting? Does it mean something special to her? Is it somewhere she dreams of being? Or someone? I think once you figure out the story, the rest will fall into place.